I'm opening up a new video project (and the thing that I really came up with the Stumbling Tours rebranding for) - it's the history of Epic MegaGames! This will be an occasional video series, because I don't get nearly the amount of time that I used to to work on these things - but I'll take it from their very beginning to the release of Unreal Tournament in 1999. This first video covers ZZT and its successors. Originally I'd meant to do more, but I talked about them for twenty minutes and felt that that was long enough for a first part already. I'm trying to make a conscious effort to speak more slowly, as I've had a few people say my rapid Scottish accent makes it difficult to keep up with me - it's a struggle and I still find myself slipping! Inspired by kjorteo, I decided to try rescuing my old ZZT folder by reviving my laptop from 1997! 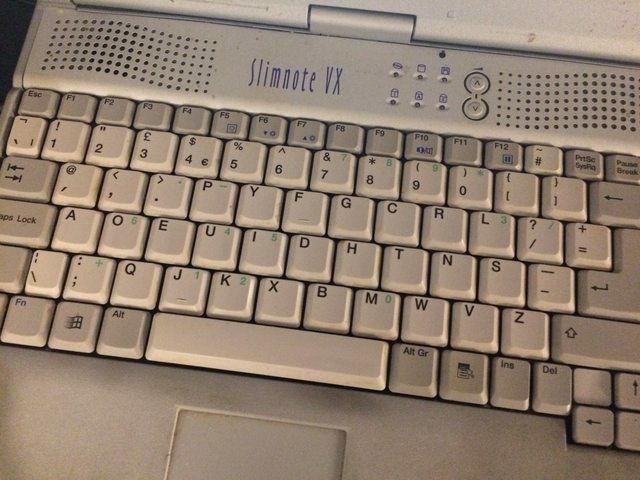 The Slimnote VX is an optimistically-named machine at best, being about as slim and streamlined as a square bleeping rhinoceros - but this is what passed for portable in the late 90s. Even towards the end of the time I actively used it, it was not the most reliable computer in the world - sometimes the monitor would just display stripes when you turned it on due to some sort of loose connection inside, but you could usually cure this by turning it off, raising it a couple of inches off the desk and allowing it to drop, then trying again. I'd left it to rot in a drawer, but I couldn't find the lost files I was looking for on my current computer, so I suspected they must have been stranded on there - so I dug it out again and rifled through the drawer of power cables. The actual original cable had a UK plug on the end and I have no idea where it went anyway, but eventually I found a transformer that fit the socket and allowed enough volts through it to power the machine up. 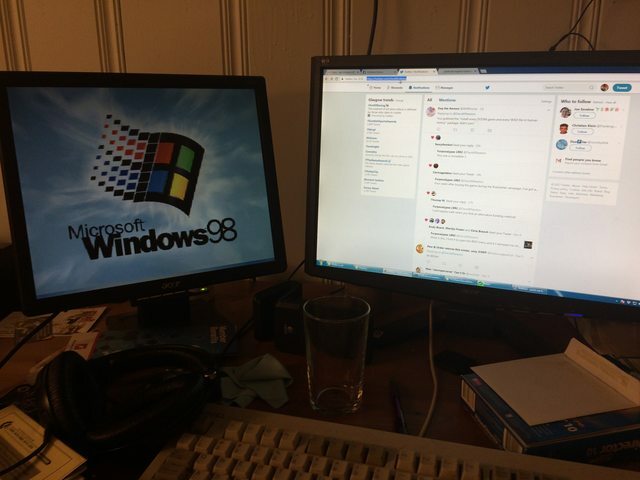 Last time I tried a few years ago, I couldn't get the monitor working no matter what I did, so I found a VGA cable and connected it up to one of my desktop monitors. After skipping a CMOS failure message, I got this anachronistic spectacle! Miraculously there seemed to be absolutely nothing wrong with the memory, processor or hard drive despite the computer's long life - it booted up with no issues and presented me with the login screen. I racked my brain for passwords I might have used at the time, but none of them did the trick - the process wasn't helped by the fact that I'd customized the keyboard in an abandoned attempt to learn Dvorak some years before. In the end I hit the Cancel button, and, er... the computer decided it just didn't care? The environment was fully functional, even looking at the user folder and Program Files, so I'm not sure what the password was meant to do. The startup sound was still set to Zeus from Altered Beast shouting an approximation of "Rise from your grave! ", a sound effect that has never been more appropriate. Even the actual laptop's monitor had miraculously come back to life at this stage, even if it occasionally displayed snow if I leaned on the trackpad too hard. After looking around a bit, I discovered the ZZT folder with the files I wanted still preserved there. The puzzle now was in how to get anything off the computer - it's sort of incredible how inconvenient this was in general was in the late 90s, and somehow we just didn't notice how we got to where we are today because the change was so gradual. The Slimnote's entire onboard networking capabilities are a telephone port for a modem, and an infrared bulb on the right hand side that presumably could be used to transmit files by flickering it really fast at a similar machine. It has no wireless capability and no ethernet port (I had a PCMCIA expansion card for it when it was my main university computer in 2002 but I have no idea what happened to it). It has a CD drive, but it's non-writable. It has a floppy drive, which was looking like the most viable option at this stage, but I would have had to first find out how to acquire a diskette and then either get a USB floppy drive or drag the files through a second, slightly less old computer. My first MP3 player! This is a Creative Labs Nomad Muvo, and is a Flash drive with a couple of buttons on it that you can connect to a battery pack to form a portable music player. 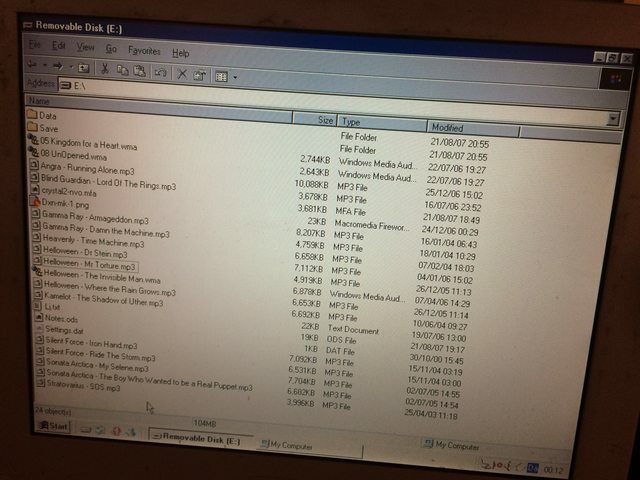 It holds a whopping 128MB, and was almost full when I put it in the drive, so I had to tarnish the time capsule and delete a few things that I knew I had elsewhere in order to fit my refugee files on. For posterity, these were its contents, frozen in time at the moment I was given an iPod for Christmas. Then came an obstacle that I hadn't anticipated - getting a modern computer to read the thing. 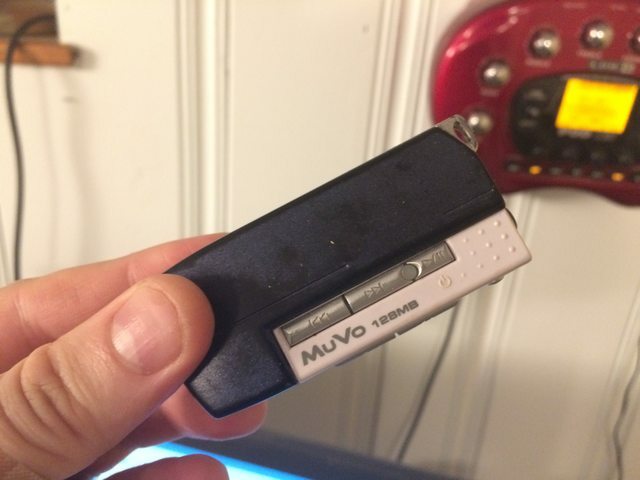 Though I was under the impression that a USB drive was just a USB drive in today's world, it seems that support and drivers for the Muvo ended with Windows XP. Therefore, I dragged my slightly newer but equally decrepit Lenovo Thinkpad out from the drawer - this was my work computer for my first job in Boston, a tiny content management system company that I'd left when we sort of ran out of money. It had survived four years with multiple repairs, including a stack of Post-It notes wedged between the inner case and the graphics card to cure a known issue with the series where the graphics card would come unstuck from the motherboard. On my last day at that job I remembered out loud to the boss that I'd better clear the laptop off and give it back, and he replied that I should probably just keep it. I turned out not to need it at the last minute, though, because even though my Windows 7 computer and my wife's Mac couldn't recognize it at all, my current laptop with Windows 10 did it on the second attempt with no additional drivers needed! So it's a useful operating system for something other than randomly shutting down to update and losing your work. With that last connection made, I was able to get the files off the lifeboat and submit them to the Museum. Therefore! Please feel free to take a look at the introduction boards for a hastily abandoned sequel to The Mercenary, and a room I put together for a community project that never got off the ground. I'll talk more about them later on. Castle of ZZT - The pirate version! I just remembered about something very weird that happened to me a long time ago. 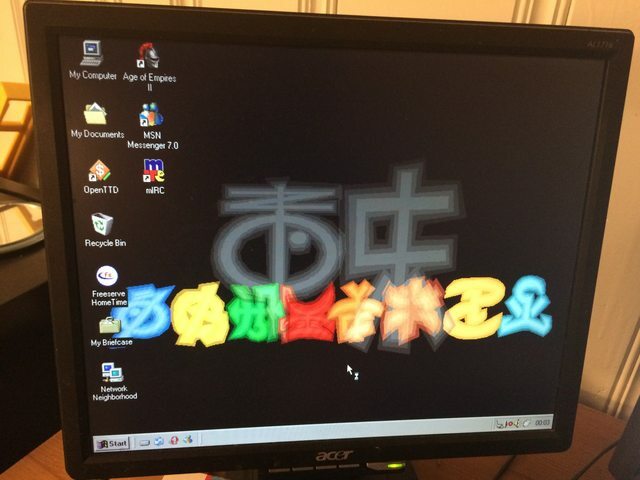 When I first came to live in America in 2006, I had two suitcases of possessions, and a desktop computer was not among them - my personal computer was an increasingly eccentric bulky laptop that was built in 1998. After moving into our flat and ordering furniture, household things and computer parts, I chose to spend the time with my limited computer power writing a ZZT game. This became Castle of ZZT, and with the time I was forced to spend on it combined with the way that I actually drew a plan out before starting, it was by far my best effort in this department (though this might not be saying much). The weird part was after I submitted it to Z2, the premier site for both ZZT and impenetrable lunacy at the time. Games went into an approval queue that was publically visible before being added to the site, to make sure they weren't spam, and I checked to see if it had been accepted once in a while. But on one check, I saw my uploaded ZIP had been replaced with one that had a different file size - and there was also a new ZIP that was called "castle_of_zzt_use_this_one_instead.zip" or something along those lines. Curiously, the "OF" has been removed from the title screen. The same has been done to the scroll that you pick up in the first room - the game's title is changed to just "CASTLE ZZT". Messing around with the first part of the game, I don't notice any other obvious differences, though I haven't looked very closely because it's quite long. But slightly later on, things get strange. The castle has a large central staircase (which I could have made less awkward to navigate, looking back), which allows you to take several routes at the start of the game from the first and second floors, and you'll get a key to access the stairs up from the second floor at some point. In the actual game, these stairs lead to an aerial view of two towers, which contains a puzzle that you have to plan ahead for. But in the altered version, a third floor has been added instead. It's decorated in red, convincingly in the same style (using the same kind of "splat a KevEdit gradient background on it" aesthetic that I used throughout the rest of the game). The boards are all named "Third Floor" with cardinal direction markers afterward so that the mysterious editor could keep track of where the rooms lay. The floor is laid out as a largely empty maze of twisting passages that are consistent but not logically laid out - you can loop around by going north or south. But if you keep heading roughly northwest, you can progress. ...you reach the end of the game, which is my own "THE END" message from the end of Castle of ZZT, shifted up on the board a bit with the red/grey type of background from above added. And then it ends - no further clues are offered. This is the only way to finish the game, as the boards that would have let you escape the intended route south from the main entrance have been deleted or overwritten. After discovering the switch of files I asked the site's admin, who I think at the time was Quantum P., and he helped put the real version up - but I saved this oddity to preserve it. The readme accompanying the ZZT world file was left intact, and my name was still on the game with no other credit added. With the game largely unaltered at the start, was the idea to make people think that they were playing my game and then for it to appear that I'd gone mad halfway through? That's my only guess - they had clearly put a fair amount of effort into whatever it was they were doing, but I never worked out who this was or why they did it.